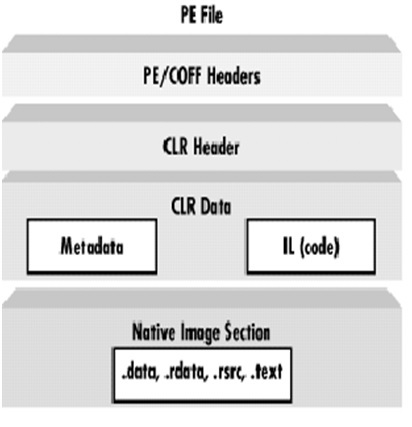 Learn: What is PE file format in .Net framework? What are the parts of the PE file format, what are the other formats which support PE file format? PE stands for Portable Executable. Windows executable file (.EXE ) and DLL (Dynamic Link Library) follow the PE file format. This is derivative of the Microsoft Common Object File Format (COFF). COFF header contains information regarding exe or dll file. CLR header contains information about CLR how to manage memory, other stuffs related to CLR. CLR data contains metadata of ddls and MSIL code generated by compilers. And last part of PE format contains native image section like .data, .rdata, .rsrc, .text etc. Any compiler that wants to generate Windows executable file must follow the PE/COFF specification.